Anthony Whitelands, an English art historian, is invited to Madrid to value an aristocrat’s collection. At a welcome lunch he encounters José Antonio Primo de Rivera, founder and leader of the Falange, a nationalist party whose antics are bringing the country ever closer to civil war. The paintings turn out to be worthless, but before Whitelands can leave for London the duque’s daughter Paquita reveals a secret and genuine treasure, held for years in the cellars of her ancestral home. Afraid that the duque will cash in his wealth to finance the Falange, the Spanish authorities resolve to keep a close eye on the Englishman, who is also being watched by his own embassy. As Whitelands – ever the fool for a pretty face with Primo de Rivera for Paquita’s affections, he learns of a final interested party: Madrid is crawling with Soviet spies, and Moscow will stop at nothing to secure the hidden prize. 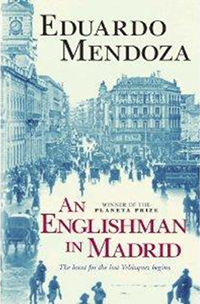 Eduardo Mendoza(born 11 January 1943) is a Spanish novelist. Born in Barcelona, Catalonia, Spain, he studied law in the first half of the 1960s and lived in New York between 1973 and 1982, working as interpreter for the United Nations. In 1975 he published his very successful first novel, La verdad sobre el caso Savolta (The Truth about the Savolta Case), where he shows his ability to use different resources and styles. The novel is considered a precursor to the social change in the Spanish post-Franco society and the first novel of the transition to democracy. His most acclaimed novel is probably La ciudad de los prodigios (The City of Marvels, 1986), about the social and urban evolution of Barcelona between the Universal Expositions of 1888 and 1929. It was adapted to the screen by Mario Camus in 1999. In October, 2010, he won the literary prize Premio Planeta for his novel Riña de gatos. Madrid, 1936, version originale de An Englishman in Madrid. “Handing Anthony the key to his room, the hotel receptionist told him that a gentleman had been asking after him that afternoon. “Absolutely. I attended him myself he gave your full name. He didn’t leave any message or say if he would be back. From his appearance he was probably a foreigner, although he spoke Spanish as well as you, but with a better accent, if you’ll permit me to say”.